View our Baked Oysters with Spinach, Watercress & Parmesan featuring Living Goodness Quick Draw Slaw. 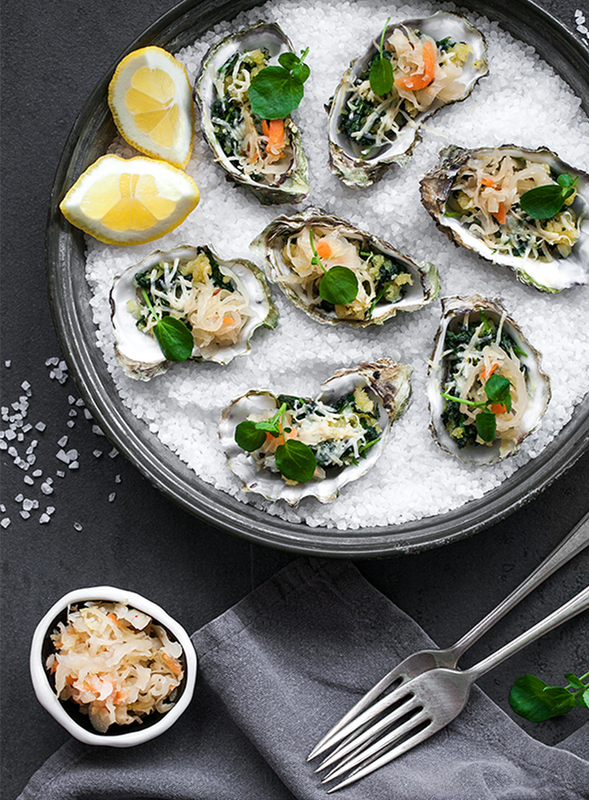 Indulge in these delicious baked oysters, topped with garlic sautéed spinach, watercress and melted parmesan. Perfectly paired with a side bowl of Quick Draw Slaw. • Position rack in top third of oven and preheat to 230C. • In a large skillet, sauté garlic in butter until tender. Add spinach and watercress, cook until wilted. • Add a splash of white wine and cook a few minutes or until all the alcohol has evaporated. • Stir in the breadcrumbs, season with a pinch of salt and pepper. • Spread coarse sea salt into baking pan. • Arrange oysters in half shells atop rock salt. Top each oyster with 1 tablespoon spinach mixture and sprinkle with Parmesan cheese. Bake until cheese browns on top, about 8 minutes. • Serve baked oysters immediatelyon a bed of coarse sea salt with a side bowl of Quick Draw Slaw and lemon wedges.